OPC is pleased to release its draft Strategic Priorities to Protect California’s Coast and Ocean, which will guide OPC’s priorities and investments over the next five years. We welcome feedback on this draft plan. Public comments should be submitted to COPCpublic@resources.ca.gov by 5 pm on April 19, 2019. 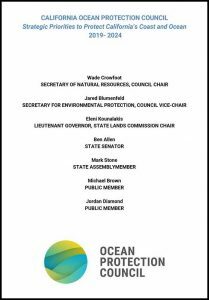 A revised draft, based on public comment, will be released on May 3, 2019 for consideration by the Ocean Protection Council at its May 15, 2019 meeting. Questions can be directed to OPC’s Deputy Director, Jenn Eckerle, at jenn.eckerle@resources.ca.gov. *Please note that this draft has not yet been formatted by a designer. The final document will include photographs and graphics.